Hello! Here’s your first assignment for this course. A few weeks ago we talked about being “on the right track” or “on the wrong track.” Remember that if you think someone or something is on the right track, then based on what is happening now, it is going in a good direction, and the future will be positive. On the other hand, if you think someone or something is on the wrong track, then the future will probably not be good, at least based on present conditions. Choose one or more of these questions and answer it (or them) in at least a complete paragraph. 1. 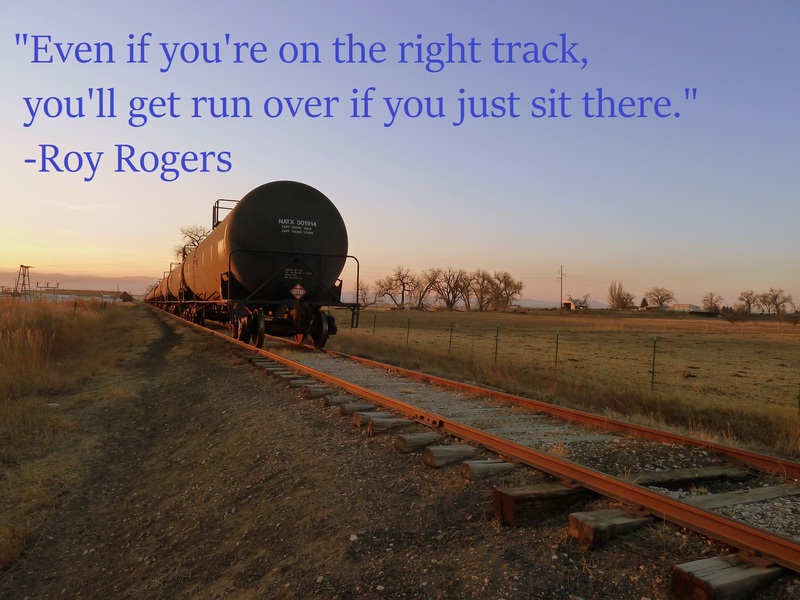 Is your life on the right track? If so, what are you doing now that will lead you to a successful future? If not, what things could you possibly do to correct things and get on the right track? Think about both your personal and professional/educational life. 2. This is a similar question, but for Costa Rica (or another country of your choice). Based on things that are happening now, do you think the country is on the right or wrong track? Give a few examples of how things will be in the future if specific things change or stay the same. 3. This is another similar question, but for the world in general. Is the world on the right or wrong track, and why? Give some specific examples. Well, I guess my life is on the right track because I’m studying what I really like and taking an English course at the same time with really good teachers; they’ve (including you) helped me to improve my skills a little bit more in the language, that’s something that i’ve enjoyed, and I think it will take me to a successful future because every engineering nowdays is a weapon that could help us to make a change in the world, creating big companies around the world. I also think that my life is on the right track because I was raised by good parents, they’ve taught me how to be a man and how do the right think in any moment. MY LIFE IS GOING RIGHT TRACK BECAUSE I ‘M WORKING ON A COURSE THAT FILLS MY EXPECTATIONS AND I ALSO LIKE VERY MUCH. ALSO THE NEED FOR A VERY PROMISING FUTURE. FOR EXAMPLE WITH THE STREETS ARE VERY BAD. BUT THAT APPLY TO THE ENVIRONMENT IS THE BEST IN THE WORLD CONGRATULATED HIM FIGHT TO PROTECT OUR RESOURCES. ENVIRONMENTAL AND CONTINUE FIGHTING INCREASINGLY. WE ARE DESTROYING THIS BEAUTIFUL PLANET CALLED EARTH. 1. Hi, I have chosen the first question. I had been thinking that my life is on the right track because I try all the time to do my best in things. When I start to do something, I never let this thing without finish, because I think “If I decided to start something I must finish it. Why? Because if I let it half, it could become into a custom and my life will be full with incomplete things. What are you doing now that will lead you to a successful future? I try to get out of my comfort zone. Always I try to look for new things to learn and to do. If God lets, next year I will start with my MBA. Finally I always procure to be surrounded by people from that I can learn and have nice time. 1.ok, Is your life on the right track? I think that my life is on the right track because I am studying, I am taking course and I know what I want to my future and I am trying to make my goals and trying to improve my grades in the high school to have a good grades in the future and I am trying to change bad things that I have for be a better person and those are the reason about why I think that I am on the right track. Ok I had chosen the first one, and the last one. I have been studying English. That for my future is very important, to work, visit another country. – I`m studying English, then I can work with people from United States or England. Then I can earn money. Another thing I`m doing for have an successful future is trying to do things new (in another words, get out of my comfort zone), and try to learn what my limits are. I don`t anything more to say. if some one say something that they don`t like they don`t accept that and kill them. The problem is that if we don`t change our mind set. Our world will be destroyed by us. YES, even though many people don´t believe, my country is on the right track. Why? In Latin America, Costa Rica stands out as a leader in clean energy by having an energy matrix based mostly on hydropower and hope to rely on renewable sources by 2021. So, for me this is amazing, that means Costa Rica doesn´t use hydrocarbons to supply the county with electricity since early 2015. I chose the first question! I think that I am in the right track because I am Sure that because I studied what i liked, and know an other language its a really good advantage in my life, i always try to do the things the best possible. I enjoy be with my family this are the best moments share with them. In the life, always it will be some troubles but I always try to be positive and go ahead, it will learn you to be strong in your life. – Is your life on the right track? yes, because I study and I learn another language and I know it is a good advantage for my career, and I always try to do rights things and If somebody need my help I will try to help him o her. – Is the world on the right or wrong track? The world is on the wrong track because the countries think only on the money and they send terrorists to others countries and they kill innocent people and they don’t care that, and the people destroy the environment and they or we don’t realize that if we continue polluting the air the water and cutting down trees we will die soon. I think yes, because I try to be a good person, I don’t have any addiction, I study and I know what I want to be in the future and I have some goals in my life that i want to complete. Is the world on the right or wrong track? Is in the wrong track, because people think is not important what we do with the environment, we don’t try to help the Earth and people think that the best option is kill an innocent people. First, I think that I’m on the right track, first because I’m study and I lear another language, and I want to lear more languages, and I want to have a future, I want to be professional, and have a very good job, and have a good family. I think that C.R is ok the wrong track, because the environment is very pollute, and the every day, we have more robbers, and sometimes, almost always, the police officer are very bad. I’m not sure about this answer, maybe, we would be on the righ track, because the technology is very advanced and that is veey important, but, in some countries, there are many wars and If we continuos like that, we maybe would have The third world war.